As Congress and the Trump administration contemplate a $1 trillion investment in infrastructure, the question of how to utilize those dollars looms large. If the focus is just asphalt and concrete, it will miss the heart of American manufacturing. At the top of manufacturers' needs is access to good, consistent, high-quality feedstocks to make into new products. Let's help meet that need with some of the best possible domestic sources of raw materials: the paper, plastics, glass, metals and packaging discarded by U.S. homes and businesses. That means including funding for improved recycling in the infrastructure bill as a way to ensure long-term reliable supply created right here at home. Modern infrastructure means resilient cities that make decisions based on long-term thinking. Yes, we need roads and bridges, but are we just interested in rebuilding the infrastructure of today? We need to think of the infrastructure of the future, the kind of infrastructure that ensures America's competitive edge and that supports a forward-thinking circular economy that serves the environment as well as the bottom line. We cannot thrive as a country if we don't connect environmental health and infrastructure. That's where recycling comes in. When it comes to manufacturing goods, we have two choices: take materials from the earth or keep them in cycle. Keeping them in the cycle saves an enormous amount of energy and keeps us from creating more methane-spewing landfills. More than 150 million Americans "vote" for keeping materials in the cycle by putting out their recycling bin every week. As materials move through that cycle, they create jobs every single step of the way. To manufacturers, keeping the materials in the cycle is increasingly critical. Here's an example. The Coca-Cola Consolidated bottling plant in Greensboro, N.C. produces beverages in plastic bottles that are sold across the region. 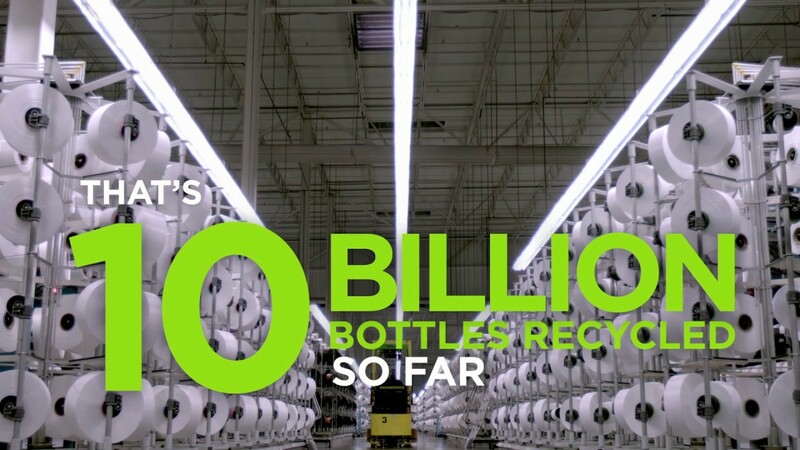 Many of those soda bottles are collected by local recycling programs and delivered to nearby Material Recovery Facilities where they're sorted from other recyclables, baled, and shipped to a recycler. Unifi, a long standing and fast-growing North Carolina textiles company, buys some of those bales and spins them into yarn called Repreve. This popular yarn is woven into lots of products made by other U.S. manufacturers from upholstery to swimsuits. Plastic bottles going into products Americans use every day is a local, regional and national success story. It means, among other things, a more competitive U.S. textile industry and factory jobs kept on-shore. Better recycling is all we need to create even more jobs and to revitalize more U.S. companies. But we have some work to do. While recycling feels universal, only half of Americans can recycle at home. And of those that do recycle, many only recycle half of what they could. That means we're missing out on 22 million tons of recyclables that could be delivering powerful economic and environmental impacts. If recovered, our estimates based on tonnage and current market values show that those recyclables would annually deliver $1.8 billion to our economy and reduce pollution equivalent to removing 10.5 million cars off the road, every year. And that's where infrastructure funding becomes critical. Congressmen and women have a golden opportunity to help their hometowns and their districts with funding for recycling in the federal infrastructure bill. These dollars could help communities provide universal recycling access to their households through the procurement of recycling carts, trucks and other equipment (all of which is also made in America). Further, Congress should use this infrastructure bill to move the country toward a more circular economy, one in which manufacturers design and produce products with the intent of reusing materials again in the future. Do you know who is already taking these kinds of bold moves forward? China. And who will be our greatest economic competitor in the decades to come? China. Businesses can be—and want to be—part of the solution. This administration can champion American corporations as they work with government, cities and towns, and nonprofits to rebuild the nation's infrastructure. Today, there are 30 major corporations—The Recycling Partnership's corporate funders—that collectively have leveraged more than $27 million to improve recycling in more than 500 cities and towns across the nation. These companies know that improving recycling is to their economic advantage and that participating in recycling helps them reach their corporate sustainability goals. It is time the federal government takes as much responsibility for recycling as our cities and towns do. Recycling is the best way for the government to join the private sector in building strong manufacturing and in working toward infrastructure—economic and environmental goals that are good for people, the planet and profits. Keefe Harrison is the chief executive officer of The Recycling Partnership.